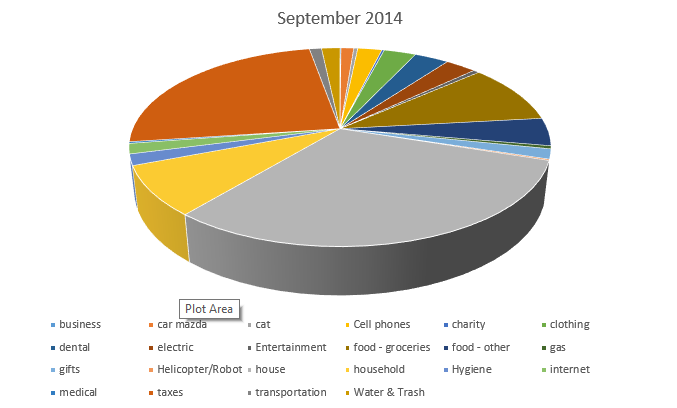 In almost every category, we really spent less in September than we did in August. I'm not entirely sure how to explain it - it wasn't a conscious thing, but I guess it's just one of those things that happen, a vagary of the market. One thing I did notice is that we have bought clothing every single month this year. That seems outrageous to me! It's not quite as bad as it seems, I think - one month it's stuff for Pickle and the new baby at a consignment sale, another month it's maternity stuff for me or replacing socks that are (*cringe*) five years old, another month it's stuff for Peanut, so it's not like we're all stocking up all the time. Also, I think at some point diapers were being categorized as clothing, which makes sense for cloth (I think?) but maybe less so for disposables. This is the one problem I have with our tracking system - we both participate, so sometimes we categorize the same thing differently (or heck, sometimes the same person categorizes a purchase differently from one time to the next) or there's no good way to categorize it but it's not worth adding a new category in the middle of the year (like separating out baby boy's purchases from Pickle's). Ultimately, this data is of no interest to anyone but ourselves so it's fine, but every year when we look back it's like "WTF were we thinking there?!" for some small percentage of the information. This has helped us refine our spreadsheet year after year, so the data is getting better, but it also means that it's very hard to do true apples to apples comparisons. At any rate, September was a good month for us, despite the unpleasantness of the stock market. How'd it go for you? That's some good trends there, reductions in all areas in one month..I hope to see that one day!